“Listen — Travis Coates was alive once and then he wasn’t. John Corey Whaley’s first novel Where Things Come Back is one of my favorite books, so when I heard that he was writing another one I knew that I would have to read it as soon as possible. I was surprised when I discovered that it was actually a science fiction book, but that just made me all the more excited to read it. Needless to say, I had high expectations of this novel right from the start. Well, Mr. Whaley definitely didn’t disappoint! Noggin is funny, entertaining, thought-provoking, and heart-wrenching all at the same time. I couldn’t help but root for Travis, the main character, the entire way through- he’s a down-to-earth guy who simply wanted things to return to the way they were before his life was turned upside-down. I felt an incredible amount of sympathy for him, but I also felt just as much for Cate and Kyle, Travis’ girlfriend and best friend from before he died. Both sides were confused and frustrated and lost, and Whaley did a great job at making the reader understand what it was like from these two important perspectives. Travis’ parents were a large part of the story, which is not too common in the young adult genre. However, I was so glad that they played some major roles in the novel because it would have been much too unrealistic if they hadn’t. And their perspective is much too interesting to leave out- their son came back to life, after all! I really admired the way Whaley seamlessly blended science fiction and contemporary young adult fiction together. I suppose this story took place in the future, but really it could have taken place in modern-day society, with the one exception being that we don’t have the medical technology to bring people back to life (yet?). But other than that detail, it was essentially a contemporary read. There were times that I sort of forgot about the sci-fi aspects of it, and then Travis would mention something about his head and I would suddenly remember what the story was actually about. The story is very character driven, which I think is a good thing; not only is there a fascinating concept and setting, but the characters are very strong and developed as well. Overall, I loved this book! While I am still partial to Whaley’s debut novel, I was still thrilled by how excellent his second one turned out to be. Hopefully this won’t be his last! Would I recommend it to a friend? : Absolutely! Fans of science fiction and regular contemporary stories would both enjoy this novel. 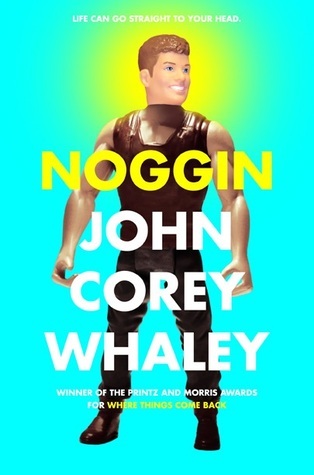 Have you ever read this or John Corey Whaley’s first book? What did you think? Let me know in the comments section below!